FREDERICK, MD – This week, the Tourism Council of Frederick County, Inc. (TCFC) marks the 30th annual National Travel and Tourism Week along with other communities across the country. Partners representing major sectors of the travel industry in Frederick County will attend the TCFC’s Spring Membership Social on Wednesday, May 8, 2013 at the TownePlace Suites Frederick to celebrate the jobs and economic impact created by visitors to the region. “Travel supports 14.6 million jobs across the nation, including thousands right here in Frederick County,” said John Fieseler, Executive Director for the Tourism Council of Frederick County. In 2011, more than 1.5 million visitors traveled at least 50 miles to visit Frederick County. The $325 million spent by those visitors directly covered the salaries of 3,777 employees, and supported a total of 6,075 jobs when indirect and induced spending is included. “Visitors to Frederick County help support our local economy,” said Fieseler. According to the new Economic Impact of Tourism in Maryland report released in January 2013, visitor spending in Frederick County increased by 12.7% from 2010 to 2011. “These new numbers indicate that visitor spending has exceeded pre-recession highs,” said Fieseler. 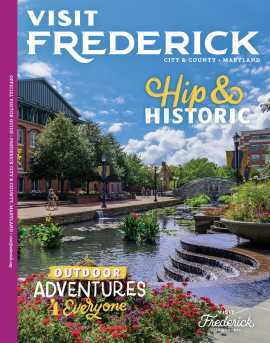 “Downtown Frederick’s dining and shopping opportunities, year-round events, and the area’s rich Civil War and American history experiences make Frederick an ideal destination for both business and leisure travelers,” said Fieseler. Reports released by Smith Travel Research show that hotel revenue grew 23% from 2010 to 2012. For the first time, Frederick County saw more than $45 million in annual hotel revenue. In 2013, the TCFC is preparing to welcome visitors for two major commemorations. Over June 14-15, the “Star-Spangled Banner” manuscript will visit Frederick in anticipation of next year’s 200th anniversary of the September 1814 writing of the “Star-Spangled Banner” by Francis Scott Key. Frederick is Key’s hometown and final resting place, and a series of events and commemorations are planned over the two-day period. Additionally, thousands of visitors will be headed to nearby Gettysburg, Pennsylvania for the 150th Anniversary of the Battle of Gettysburg this July. “We are working cooperatively with our partners in Gettysburg and local hotels to plan for this,” said Fieseler. “Beyond these signature events, we have ongoing related exhibits and experiences for visitors year-round,” said Fieseler. “Travel is a force that can drive our nation’s economic recovery. It is one of the healthiest sectors in terms of job creation and hiring, employing one out of every eight Americans,” said Roger Dow, president and CEO of U.S. Travel, the umbrella organization representing the U.S. travel industry. “We are galvanizing support to spread awareness of the Travel Effect to showcase the power of our industry and its impact on not only our economy and businesses, but also on our health, education and relationships.” The “Travel Effect” theme is part of the U.S. Travel Association’s multiyear campaign to prove through authoritative research the real and meaningful impact the travel industry has on our lives, businesses and economy. Travel Effect research demonstrates that along with its economic benefits, travel has the power to improve relationships and to create lasting family memories. Additional studies include measuring the bottom-line impact of business travel and the impact of government meetings on public- and private-sector development and local communities. More information is available at www.traveleffect.com. According to the U.S. Travel Association, travel and tourism generated $2.0 trillion in economic output for the U.S. economy in 2012. The industry also represents one of America’s largest employers, supporting 14.6 million jobs (including 7.7 million directly in the travel industry and 6.9 million in other industries). Direct spending by domestic and international travelers averaged $2.3 billion a day, $97.7 million an hour, $1.6 million a minute and $25,125 a second. To learn more about the Tourism Council of Frederick County and discover more things to see and do Frederick County, Maryland, visit www.visitfrederick.org.